It's awfully hard to disagree with the observation of car salesman Rob Bojaryn: "If they can't administer a program like this, I'd be a little concerned about my health insurance." 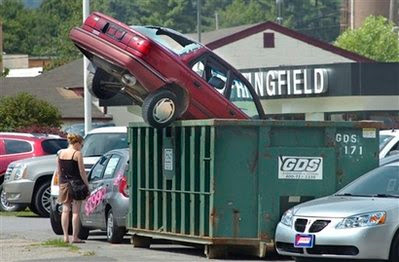 President Obama's "Cash for Clunkers" program has proven to be a disaster after just six days. Under the program a person can trade in an older/less fuel-efficient vehicle for as much as $4,500 credit toward a newer car. The money allocated for this thing has already been burned up and now Congress is allocating an addition $2 BILLION for it. Where in the Constitution of the United States is there found authorization for the federal government to be in the used car business? And then, why is our tax money being used to help someone else buy a new car? I've bought cars before, and I've never approached the government for any financial assistance toward some new wheels. Can't see how it should be any different for anyone else.